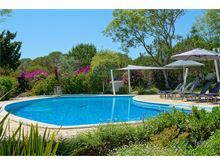 Casa Kios is undoubtedly one of the most magnificent homes available to rent in the Quinta do Lago area and indeed the Algarve. 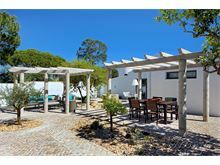 The current owners are the next generation of the original family who built Casa Kios and have refurbished the property with the utmost attention to detail. 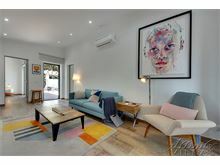 All the original architectural splendour is retained with high end modern furnishing and fittings making the property both eco-friendly and sumptuously comfortable with a perfect set up for modern living. 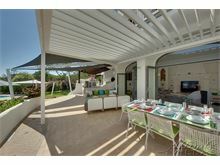 The already very spacious interior and the new outdoor living area, complete with shaded terraces, sofas, dining area and state of the art outdoor kitchen, seamlessly blend the outside with the inside to give the ultimate in al-fresco living. 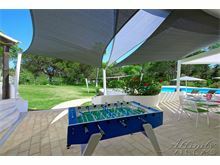 Two swimming pools, a hot tub, tennis court, snooker and games room, table tennis, table football, petanque and outdoor chess, all set in totally private and secluded grounds offer something for everyone and will make for the perfect holiday retreat for large families or those seeking an indulgent holiday with a group of friends. 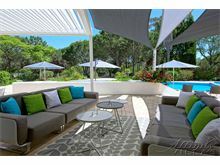 The larger pool is connected, but separate to a tiered shallow pool, perfect for relaxing with a book or for the younger members of the party to enjoy with careful supervision. The main house offers 6 bedrooms with a fabulous chefs kitchen complete with dining area for 12 and a children’s snug play area along with a further 2 bedroom cottage sleeping an additional 4 people, accommodating 16 in total. 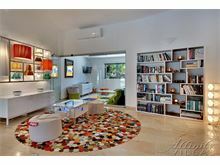 The living area has a state of the art high end entertainment system with both indoor and outdoor speakers. 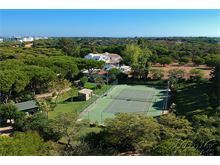 Quinta Shopping is little more than 10 minutes walk away via a pathway through the adjoining woodland area with its choice of shops, bars and restaurants very conveniently located. 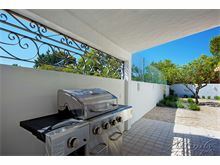 A professional English speaking couple look after the property who are also able to cater for the odd informal barbecue. 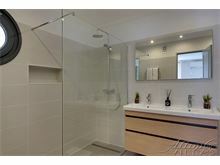 This is by mutual arrangement, subject to availability and must be requested in advance. 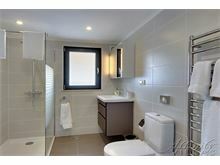 Approximately 3kms from the beach and 1km from the shops and restaurants. Electric gated driveway leads up to the main house and cottage. 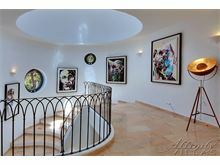 Main house Entrance hall leads to marble floored hallway, steps to the spacious living area with 55" B&O TV and sound system, Blu-Ray player, DVD and CD library, retro arcade game coffee table with over 500 games. 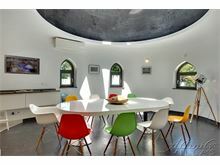 Arched windows lead out to a large shaded terrace overlooking the pool and gardens, complete with outdoor seating, dining area and outdoor kitchen with fridge, sink, gas and wood burning barbecues. 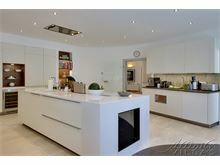 From this terrace steps lead to a shower room with WC, pool area and hot tub, outdoor table football and table tennis. 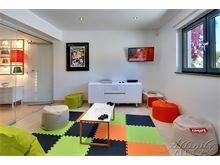 Steps from the living room lead to children’s snug area adjoining kitchen with beanbags, soft floor mats, TV, Xbox/Blu-Ray player. 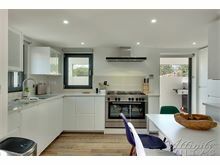 Kitchen is open-plan and fully equipped with dining area for twelve, dishwasher, microwave, drinks station, separate drinks fridge and utility room with washing machine and dryer. 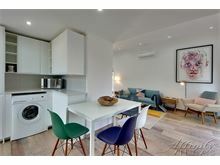 From the entrance hall there is a cloakroom, 1 twin bedroom with full bathroom en suite, walk in shower and doors to the garden, 1 double bedroom with full bathroom en suite and doors to the garden and 1 twin bedroom with shower room en suite and doors to the garden. 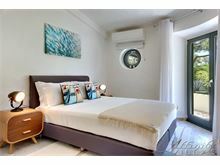 From the living room is another suite consisting of 1 double and 1 twin bedroom, each with doors to the garden sharing a large full bathroom with walk in shower. 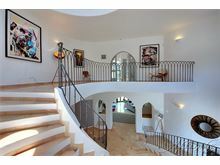 Wide marble steps up from the entrance hall to oversized master suite with super-king sized bed, TV, lounge seating, arched doorways to a private part-covered balcony overlooking the pool and gardens, plus private roof garden. 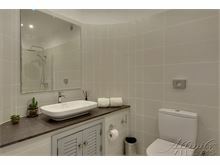 There is also a dressing room with a fridge plus tea and coffee making facilities and spacious bathroom with walk in shower and large Jacuzzi bath. Wireless speakers in each bedroom plus outdoor speakers on the upper poolside terrace. 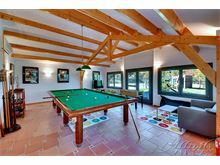 Separate games room within the grounds with a full size snooker table and pool balls, darts, TV, DVD/Blu-Ray, indoor table football, Playstation 3 and WiFi. 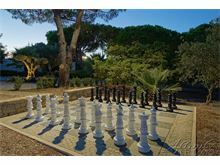 There is also a shaded petanque court, a giant sized out door chess board and a splendid flood lit tennis court with shaded seating and cloakroom. 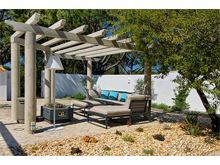 The separate guest cottage is right next to the main house entrance with 2 double bedrooms, 1 bathroom and 1 shower room, kitchen and private courtyard garden with barbecue. The villa has a comprehensive response alarm system. For parties of up to 12 clients will have exclusive use of the main house with the cottage closed. For parties of between 13 to 16 people, the cottage will be open however children under 18 must not be left unaccompanied. For parties of 12 or less that would like the use of the cottage during their stay, the published price for 13 to 16 people will apply. Maid service 5 times per week. 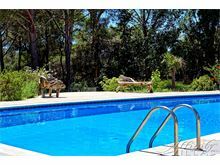 Pool heating, air conditioning and hot tub heating are available at extra cost, if required. We had an amazing extended family holiday and the villa was superb. We were a family party of 3 young grandchildren and 7 adults. 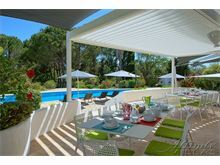 The villa gardens and pool were stunning and the internal space ideal for a mixed family group such as ours. Thanks very much for a great holiday. The villa was superb. 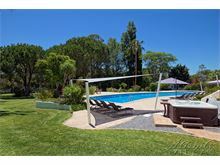 Spacious, well equipped and comfortable Pool & pool area were perfect....very large for all family aquatic sports! 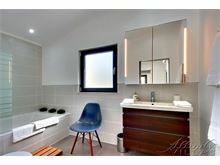 Easily accommodates 12 persons. 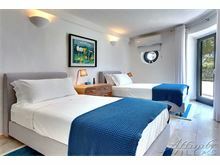 Housekeepers were very friendly, caring & lovely people Would highly recommend this to any future guests. 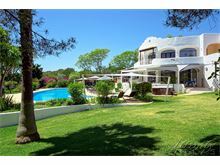 This is a beautiful big villa with all our needs catered for. Interesting artwork all over. For us it was all about the outdoors. The big pool & rear garden kept the young one's fully entertained. 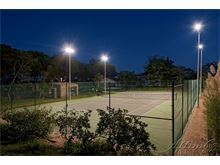 The floodlit tennis court was a big hit for the adults late evening. Would definitely return. This was a return holiday for our family to Casa Kios. We were not disappointed. 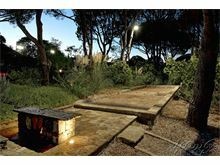 The villa is secluded which makes for a relaxing holiday. The weather was slightly cooler our first week which enabled us to make good use of the tennis court. 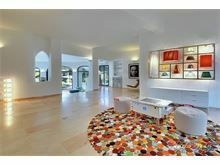 This villa feels like a home which we liked. 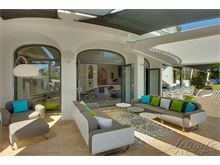 This villa is exceptional and absolutely perfect for large family groups. Extremely well equipped and comfortable will all ages catered for! 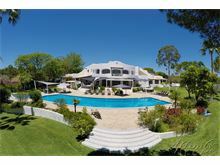 Beautiful well kept gardens pool and tennis court. Villa manager really helpful also. Would definitely stay again and would highly recommend. We have just returned from a family holiday at your magnificent villa and find it difficult to express in words what an amazing holiday we had. The villa is so beautiful and equipped so well, we cannot find anything at all to say that is negative. The attention to detail is just stunning. 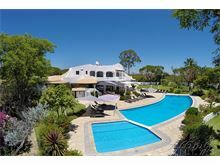 We have rented other villas in Portugal for family holidays but have never been fortunate to have one as beautiful, or to the same standard as this. 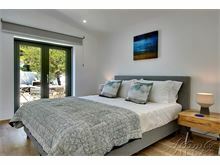 We will definitely book with Affinity Villas again. Thank you so much. Our holiday at Casa Kios was very enjoyable. 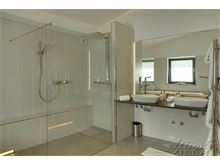 It is a beautiful villa with many facilities. We loved the homely feel to it. Ideal for sporting enthusiasts -our teenage grandchildren found it wonderful, as we all did. 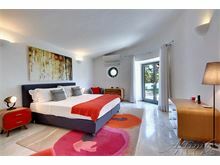 This was an excellent villa for our party of 8 adults and 2 small children. 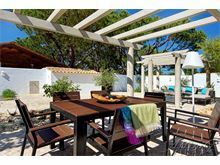 The villa had been recently refurbished and all the appliances and work and living areas had been completed to a high standard. 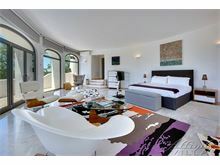 The upstairs suite that my wife and I occupied is beautiful and enormous, with 180 degree views to the pool and gardens. We had no complaints. We have stayed in several villas in Portugal over the last 15 years but Affinity Villas's Casa Kios is exceptional.It is beautifully located away from the hustle and bustle of a major resort yet near enough to all the facilities one needs, stunning beaches,restaurants and supermarkets.The furnishings and facilities are outstanding. The house managers could not have been more helpful and have a fantastic local knowledge. A truly brilliant family holiday was had by our family. 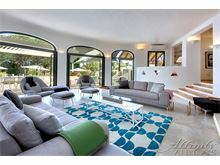 A fantastic villa which met and exceeded all expectations. To our surprise this was also a very well equipped property. The grounds are very well maintained also. The family had a great time. 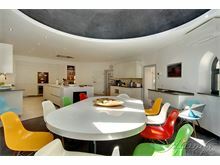 Beyond excellent villa, cannot fault it! Once you're there you won't want to leave. 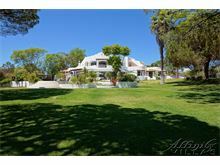 Superb villa in beautiful grounds which is very well maintained. The house managers are exceptionally good, nothing is too much trouble. 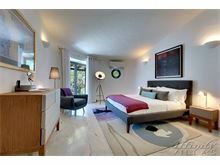 The bedrooms are beautiful and the kitchen is fantastic. 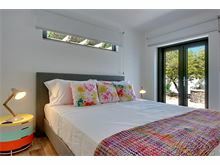 The Master Bedroom is unbelievable, one of the best rooms we have ever stayed in. 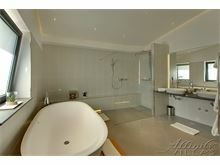 Quality of this villa will be hard to beat in the future and must be one of the best in the area. 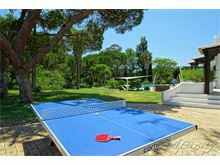 We were a smaller party than advertised, but I imagine that this Villa would easily cope with a larger party - there is so much to do at the villa (tennis, table tennis, hot tub, etc.. etc..) , it was very hard to leave! Thank you very much for an ultimate stay of luxury. 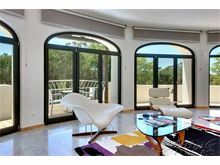 Fabulous villa, everything you could wish for in terms of comfort and facilities! Great service from the house managers, will definitely return! 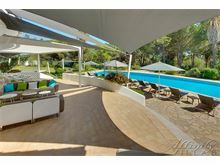 An incredible villa in a secluded yet not isolated area. 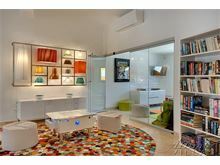 Very well equipped and opulently furnished. We’ll be back! 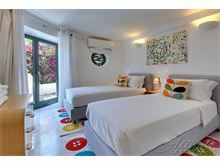 Casa Kios was an excellent choice for our family holiday. It catered for all ages from babies upwards. 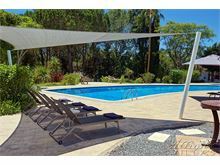 It was very comfortable with a lovely 20 metre pool and an additional children's pool. It had an outside relaxing area with an outside kitchen. it would be very difficult to improve as it exceeded our expectations. 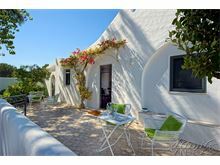 Great villa for a large group of friends or family who enjoy cooking, excellent kitchen. Casa Kios was the perfect villa for a reunion of old friends! It was absolutely wonderful we all had a fantastic time! 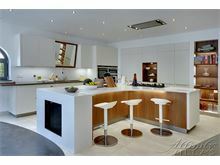 The villa has been refurbished recently and is beautifully done to a high spec especially the new kitchen, we loved the ice machine! Perfect for all our cocktails. The kitchen equipment is great especially for keen cooks and we did a lot of cooking! It really was a huge bonus especially with so many of us, it made it so much easier. 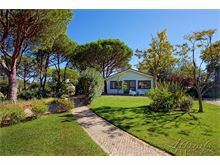 The layout of the villa is wonderful as it means there is plenty of space for everyone to find their own quiet patch if needed to just read a book or have a snooze. The garden was lovely and shady as well. 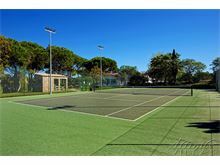 The tennis court was used a lot so that was a bonus too and floodlit. Everyone was extremely helpful. We used taxi's to go out and was brilliant getting 12 of us around to restaurants without any problem! We hope to all go back again one day. 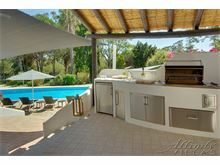 It really was a brilliant place to stay away from any other villas so it is very quiet! Don't hesitate just book it! Well, where do I begin with this hidden gem! 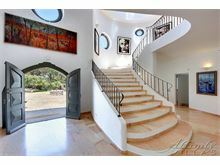 I booked this villa after hours and hours of research trying to find the perfect location to celebrate my Dad's 70th with all the family - so what drew me to Casa Kios? 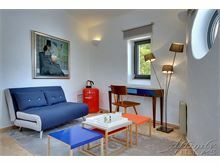 It had had a recent total refurb, she looked quirky and modern and seemed to offer something for everyone from age 7 to 70. It does not disappoint and in fact although the photos are brilliant, the real thing is far far better. The interior is sleek, featuring marble floors and fabulous modern furniture, and the cushions and throws in every room all add to the luxe feel. The kitchen has everything you will ever need and more with incredible appliances and storage - they literally have thought of everything! The 8 bedrooms and bathrooms are all different but are all wonderful and the grounds gave us hours and hours of fun, from playing in the fab pool to football in the gardens, to table tennis and boules competitions, chess in the shade and tennis in the sunshine - I could go on but I am sure I have given you a clue as to the magic of this villa! This villa was everything described and more. It is a wonderful place to recharge your batteries. 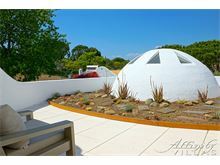 It is a short drive from wonderful beaches and restaurants. 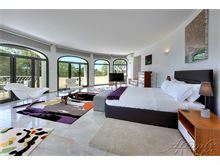 This villa could easily accommodate two families and everyone would have their own space.